This week, Universe in the Classroom blasted off for the academic year 2015-2016 with our first workshop! The event was hosted by knowledgeable Cardiff University Astrophysics student, Stellar Role Model and local girl (from the small town of Barry), Jeni Millard. The workshops took place at Ysgol Pencae, a Welsh Medium school in Cardiff and one of Universe in the Classroom’s 100 partner schools across Wales. 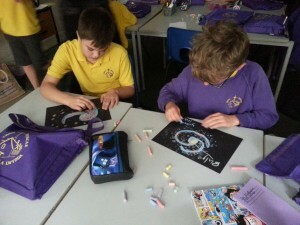 We have hosted a number of workshops with the school’s year 5 and 6 students in the past year. Jeni is local to Cardiff (growing up in the nearby town of Barry) and provides an excellent role model to the influential young audience. The first workshop looked at our solar neighbourhood: the moon, planets and Sun. At the second workshop we used the LCOGT robotic telescopes to explore the Universe beyond. This time, we looked at some of the most important and interesting cosmic objects – galaxies. The students were very excited to extend their vast knowledge of the Universe with a new topic, and to take part in another Q&A session with our knowledgable role model. One of the most notable aspects of the workshop was the enthusiasm with which students requested to revisit the robotic telescopes and the images they took with them.